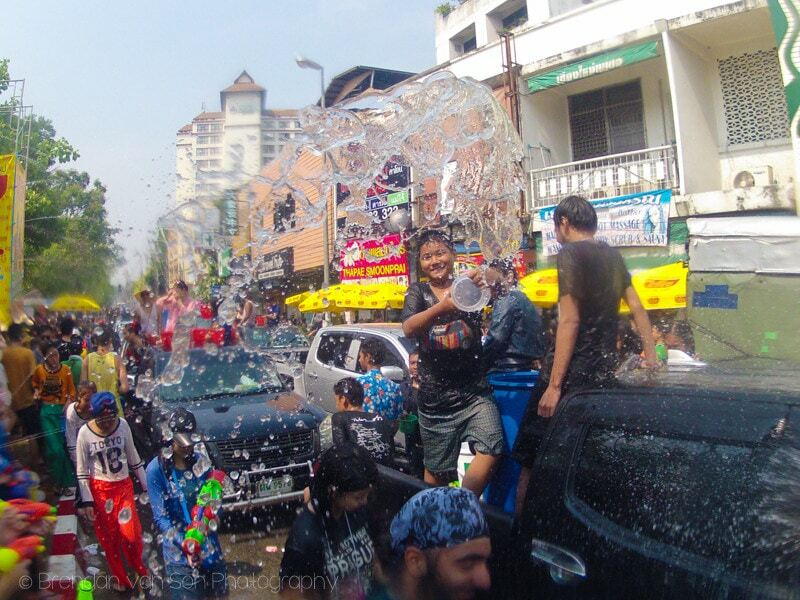 After a couple weeks of extremely hard work between a press assignment in Oman and getting a new issue of Vagabundo Magazine published, we have gone out of our way to take in the Thai New Year and what tourists like to call, the water fight festival: Songkran. For me, nothing sounded better than letting off some stream by blasting water at people on the streets of Chiang Mai, Thailand. All the stress of the weeks of work, would wash away. And in many ways, that’s exactly what happens. 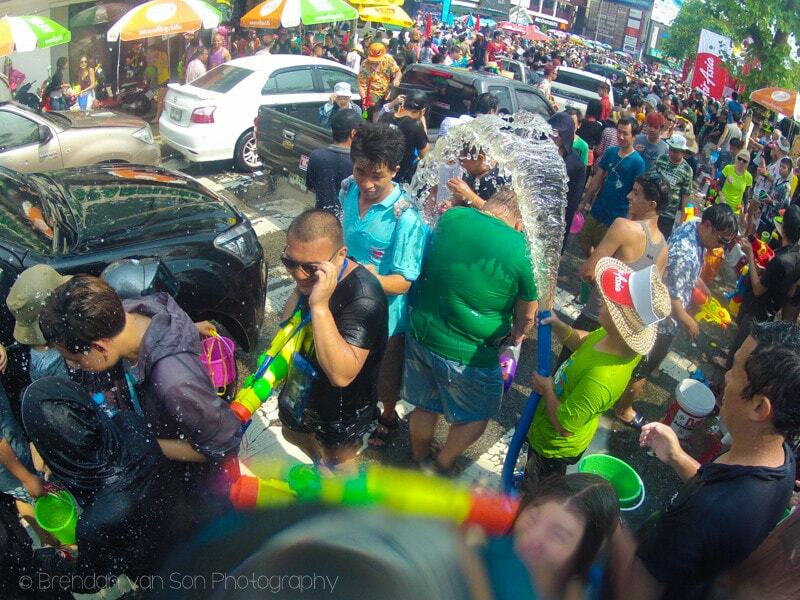 Songkran is special, it really is. There’s something completely interesting about the mix between the water “fight” aspect and the idea that being hit with water is actually meant as a blessing. And no one is safe during Songkran, either. It doesn’t matter if you’re 2 years old or 200, people are going to shoot you in the eye with a water gun, pressure tube, or full on high pressure water hose. It doesn’t matter if you’re walking down the street wearing a finely tailored suit, people are going to dump buckets of water on your head, and you’ll say “thank you”. Down the main street of the party, on the edge of the gate. The water fight has grown so intense that water sits a foot deep on the road. A man stands on the back of a truck with a fire hose dousing the cheering crowd. A scooter pushes through the crowds and as it does gets hit with bucket after bucket of chilled water. Around another corner, a group of people stand close together dancing raucously with their water guns pointed in the air as if they were just told that the war was over, and the neon coloured team won. On top of a counter, a couple Thai woman dance aggressively to the music. I get hit with a pressurized dose of ice-cold water right in the eye. I look up to see the culprit is a 70-something Thai man. He’s laughing hysterically. So am I. I’ve nearly lost my voice from making the sound effects of my gun (pew, pew) and laughing out loud. 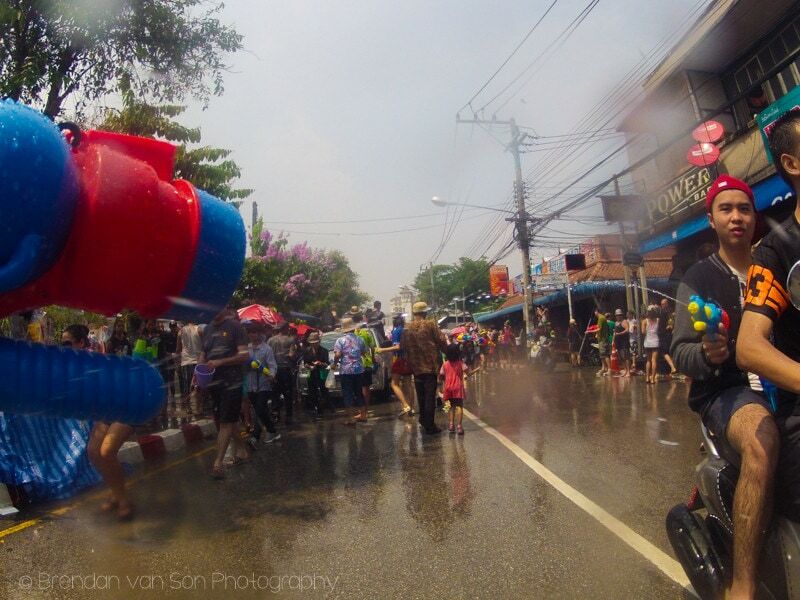 Songkran is not all good, however. Like many things in travel, it’s often ruined by the drunk tourist. At one point, an 18-something partypacker comes up and shoots Tiffany directly in the eye at point blank and then walks away smugly. I have to do all I can not to punch him in the nose. On the third day of Songkran, I’m on the way to get groceries: with my smartphone and wallet in my pockets, and a drunk tourist runs up with a bucket. I tell him I’m just getting groceries, and I have electronics in my pocket. He tells me it’s tradition and tries to dump the bucket on my head. I smack it away. It’s not your tradition, you douche, and if it was, you’d have some respect. The locals understand it far better. Dry, and walking out for some lunch, a local comes up with a bucket. I say, no, please. And he flicks just a touch of water at me and says Happy Songkran. By the end of the week, I’ve seen enough water to last me a lifetime. I can finally leave the apartment without feeling like I’m going to be soaked to the core by the time I return. 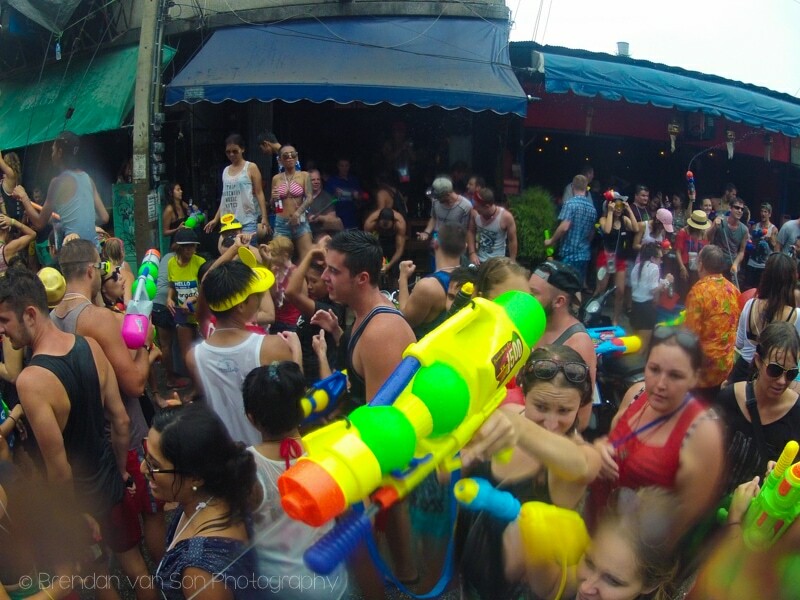 The water fight festival in Chiang Mai was exactly what I needed. For a day, it allowed me to let off some steam, to release some anxieties in water form, and to remove myself from any thoughts of work. But by day three, I remembered why I’ve avoided travelling to Thailand all these years. It’s that small minority of travellers that come to Thailand for no reason but to make bad decisions, they seem to flock here and they’re out in force during Songkran. But, I suppose, at the end of the day, even the partypackers with no interest in tradition, history, culture, or even the sights, are really just travelling for the same reason I’m out shooting a kid’s water gun at Songkran. They’re just trying to blow off some steam, and find an escape from the stresses in their lives. How can I blame them all too much, when I’m doing the same? At the end of the day, however, I think I’ll exude my form of long-term escapism far away from Thailand. I was there this year, my first Songkran. Thailand can be awesome, but as I’ve travelled to (and unfortunately, grown up) several times over the last seven years it’s becoming uninteresting, a bastion for people who just want to get messy and be generally disrespectful. I’ll take Malaysia over Thailand any day. Yeah, I’ve been at that stage in my life, and don’t really want to go back to being messy. We actually skipped Malaysia on our Southeast Asia trip. Kinda regretting it. Oh! We spent two months enjoying every single minute in Malaysia, earlier this year. There was not one place that was uninteresting or shady. The food is amazing, the people are pretty chill, nobody is trying to scam you – awesome country. I think it would be fun to experience. For a day. And then I’m sure I would get really annoyed with the drunk tourists throwing buckets of water at me, too! Definitely. Totally worth it though. I guess you’ve either gotta be a drunk tourist, or get outta town after a day.